Customer satisfaction is the most important factor in the framing process and to this end it is vital that the customer knows exactly what is happening to their piece. 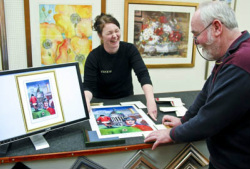 We believe that it is not merely enough to offer the widest choice of frames, mounts or colours, we also want to ensure that our customers feel secure that their framing orders will be carried out to their exact specifications. 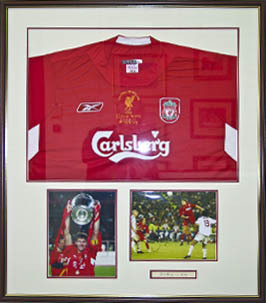 Throughout the lifetime of Scenes, we have had a vast variety of framing requests. These have included framing rugby shirts, army berets, medals, a Belleek pottery plate and even a tea bag! Putting more than one image in the same frame can make for an interesting display. Show your team how much you love them. Our new visualisation tool allows the subject to be shown exactly as it would look when fully framed. 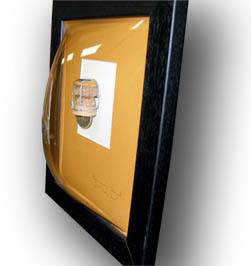 It works by taking a digital photograph of the work, and displaying it on screen, dressed in the framing style of your choice. An extra little detail that sets an event or wedding apart from all the others. Combining appropriate colours can add a special something. 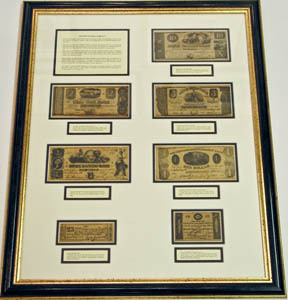 A fanatastic way to show off personal or corporate memorablia. From sporting achievements, dancing medals, to corporate badges and awards. No matter what it is you want to preserve and display we can find the right framing style that will bring enjoyment for many years.